Icon of Panagia Paramythia, Monastery of Vatopaidi, Mount Athos (Greece). 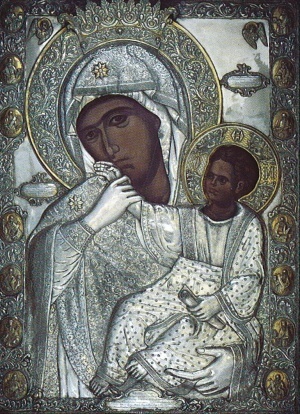 The same icon, without the silver covering. Panagia Paramythia, the Vatopedi Mother of Consolation, or Comfort is an 8th century miraculous icon of the Virgin Mary from the holy and great Monastery of Vatopedi, Mount Athos, Greece. The icon is commemorated January 21. The Vatopedi monastery acquired its name in the following manner. Near the monastery, the son of Emperor Theodosius the Great fell off a ship and into the sea. By miraculous intercession of the Theotokos and Virgin Mary, he was carried safely to shore unharmed and found sleeping in a bush, not far from the monastery. Thus the monastery is called Vatopedi (Vato + paidi, derived from "Batos paidion", the bush of the child). "Do not open the gates of the Monastery today, but go up on the walls and drive away the pirates." "No, Mother, do not watch over this sinful flock, let them fall under the swore of the pirates and be punished as they deserve." But the Blessed Virgin, taking Her Son's hand in Hers and turning Her head a little to free her mouth, repeating the same words. This last arrangement of the figures has remained permanently on the icon and has, thus, and has also earned it the rare iconographer's title of "Achaeropito". The monks, miraculously saved from the pirates, gave thanks to the Theotokos and named the icon "Paramythia", which means "calming down" or "restrain," words which equally convey the content of the miracle. The icon is a wall-painting and is on the right choir of the chapel named after it. In memory of this miraculous event a perpetual lamp burns in front of the wonderworking icon. Every day a Canon of Supplication is chanted in honour of the icon and on Fridays the Divine Liturgy is celebrated. Church of the Theotokos Paramythia, «Palace of the Wallachians, Vlach Saray» (Constantinople). This was the location of the Ecumenical Patriarchate of Constantinople from 1587 to 1597. Chapel of Panagia Paramythia, the Monastic Brotherhood of St Theodore the Studite House 449 Portland Way South, Galion OH (USA) Brotherhood discontinued on October 31, 2012. The Holy Monastery of Vatopaidi, Mount Athos (Greece) - location of original. The Holy Monastery of Panagia Paramythea, and church, in the city of Paramythia(Greece). This monastery had a cupola which protects the cross, and is covered by ceramic ornaments ... It was built in 14th century ... The church was built to honor the memory of Panagia. Paramythia took its name from the temple (which in ancient Greek means comforter). The Holy Monastery of Eliakon, Cyprus - Icon has weeped myrrh. There is one CD, circulated by the monks of the Vatopaidi Monastery (Mt Athos) with the Supplicatory Canon hymns for this icon (25 tracks chanted in Greek with total time of 68:50) has been made available for sale on the Internet for people to purchase. This page was last edited on November 2, 2012, at 22:42. This page has been accessed 29,999 times.